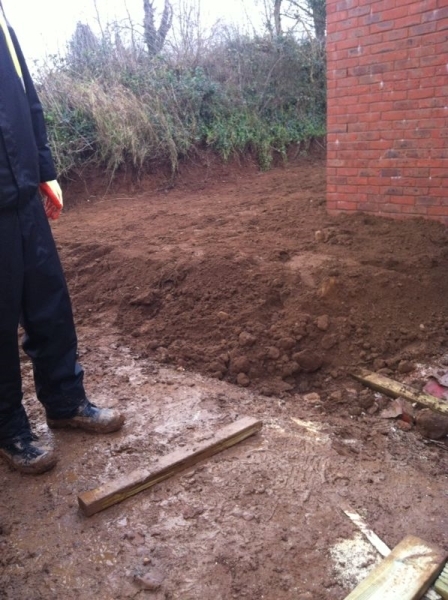 This new project was started at the beginning of this week.This job comprises of 2 show home gardens, with large frontages. There is also a large open space and car park area,which are opposite the show homes, these need to be landscaped and planted too.We have estimated this project will take approximately 3 weeks (weather permitting). The first job was to prepare the ground and mark out the different areas. The first structure to be built was the curved deck in the Stratford show home rear garden. This was completed on Tuesday and the guys were then able to start on the circular cobbled water feature in the same garden.We plan to have this garden ready to plant out next Tuesday. There is to be a wall made of boulders between the two gardens. This is to compensate for the different levels between the two gardens, we are hoping to have this in place by Friday. Once this is done work can commence on the large sandstone patio which will take approximately 4 days to complete. The workfoce this week has consisted of 3 people, next week this will increase to 7, so we can complete the project on time. I will be posting more pictures and info as we progress with each phase. Spam protection question: What is six plus nine? Very interesting, cant wait to watch the development of this garden (mud bath) will be back to follow the progress. Good luck. Hi, I'm Willy. As you probably know all good gardens have an army of worms just like me; working away keeping the soil in tip top condition by breaking down the impurities which then produce the most natural compost you could wish for. I am a part of the Create Landscaping team and my aim is to pass on my garden knowledge and tips so together we can create the kind of garden you desire and keep it that way. Alan and the rest of the team are here to help and between us I'm sure we can achieve your dream garden. Give the guys a call to see what we can do for you.